At first glance, this sweet beagle puppy seems nothing out of the ordinary. But when she is lit with an ultraviolet light, the astonishing dog glows in the dark. Ruppy - short for Ruby Puppy - was one of five cloned puppies genetically engineered to produce a fluorescent protein by scientists. 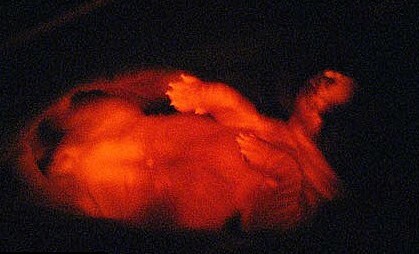 When placed under an ultraviolet light they all glow a deep red. They were created by a team led by Byeong-Chun Lee of Seoul National University in South Korea, who created the first cloned dog Snuppy in 2005. The dogs are transgenic animals, which means their genetic code has been deliberately modified rather than mutating naturally.